Full Description: SOLD - Courtyard conversion of three detached barns Swallow Barns Spanby, Sleaford, Lincolnshire. A four bedroom, high quality, energy efficient conversion of three barns. Main barn, annex, with a third barn for additional residential or business use. Set in a walled courtyard, generous plot, with two separate south facing gardens and pond. Location In the picturesque hamlet of Spanby, an area of outstanding natural beauty. Overlooking the woodland of Highfields Country Retreat. www.highfieldscountryretreat Approximately 5 miles from Sleaford. Railway station, Tesco, Banks, swimming pool, local amenities. 15 miles Grantham, with its direct rail link to London There are excellent public and private schools nearby. Sleaford and Bourne all retain grammar schools for boys and girls. Accommodation All three barns have sealed unit double glazing. 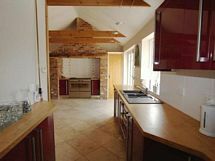 Main Barn This beautiful spacious and energy efficient barnsï¿½ heating is supplied via a Mitsubishi Air Source Heat Pump. This provides domestic hot water and heating(under floor at the ground level) at a much reduced cost. The immediate wow factor cannot be missed with a dual height vaulted ceiling and minstrel gallery, looking down into the library. On the ground floor Travertine flooring to the whole of the ground floor Entrance Hall Cloak room/shower room Corner shower unit, wash hand basin and WC Inner Hall Exposed beam, storage cupboards and stable door leading to garden Lounge 14ï¿½7 x 14ï¿½7 Multi fuel burner, French doors, recessed spot lights. Snug/Dining Room 14ï¿½7 x 12ï¿½0 Multi fuel burner, French doors Library 14ï¿½7 x 11ï¿½7 Storage cupbords, book shelving, open tread staircase, exposed brick arch. Bedroom 3 14ï¿½7 x 13ï¿½8 Recessed spot lights. 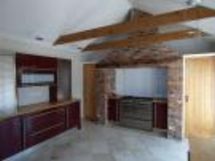 Kitchen/breakfast room 14ï¿½0 x 12ï¿½11 plus 7ï¿½3 x 8ï¿½2 Well fitted, extensive range of high gloss cupboards and draws, with brushed steel fittings. Integrated appliances fridge freezer and dishwasher. Stoves range set in brick inglenook recess, LPG hob/electric double ovens. French doors opening onto courtyard. On the first floor Oak flooring Galleried Landing Velux windows Master Bedroom 14ï¿½7 x 14ï¿½7 Vaulted ceiling, fitted bedroom suite, French doors, Juliette balcony, En-suite Shower room Shower, hand basin and WC Bedroom 2 14ï¿½7 x 9ï¿½4 Vaulted ceiling Family bathroom Japanese Omnitub duo bath, shower, twin hand basins, WC Annex Tiled floors with electric under floor heating. Bedroom 4/sitting room 16ï¿½10 x 10ï¿½9 French doors leading into the garden, Utility 8ï¿½7 x 7ï¿½6 Stable door, fitted cupboards with work surfaces, plumbing for automatic washing machine. Shower room Shower, WC, hand basin Barn 3 Split into three areas Area 1. 19ï¿½9 x 14ï¿½5 plus 9ï¿½10 x 5ï¿½8 Area 2. 13ï¿½2 x 11ï¿½9 max Area 3. 9ï¿½8 x 6ï¿½0 WC with and hand basin Outside The front of the property is not overlooked and looks onto established conifers. There are full height double gates leading through a car port, to a gravelled courtyard with ample parking for several vehicles and log store. This leads on to a south facing formal garden with pond, which all three barns look onto. To the rear of the third barn a further garden, vegetable patch and large wooden shed. This listing has been viewed 6291 times.